Oh dear, we are quickly running out of days to finish our bedroom makeover. In good news, I’m LOVING the parts that have come together. In bad news, we only have 5 days until I need to be taking photos. Oh, and I’ll be out of town 2.5 of those days. YIKES!!! If you’re a first time visitor, welcome to the madness! I’m at the end of a wonderfully chaotic process called the One Room Challenge (ORC), and our One Room is the master bedroom. You can get all caught up on the before photos and my plan for our Uptown Meets Downtown bedroom back in this post. Once you’ve read that, hop back here for the latest happenings in the room. Getting all the drop cloths off the floor and the furniture moved to the right spots was a HUGE relief. 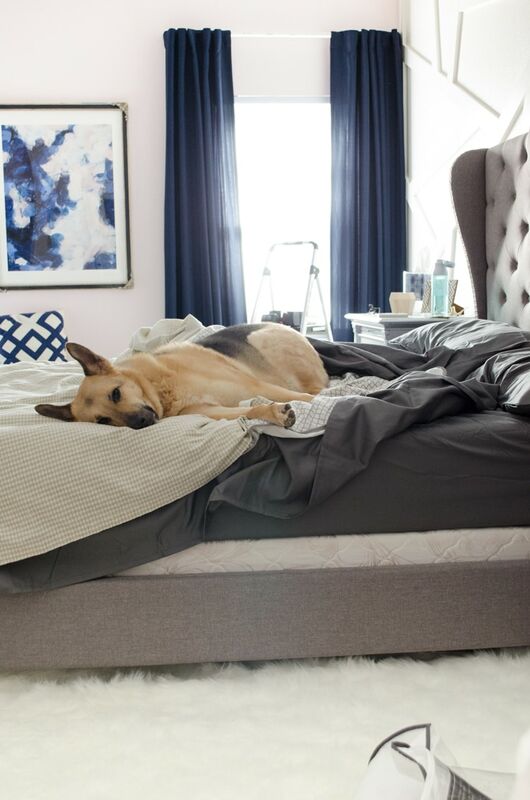 Even though messes of tools and supplies are covering much of the space, something magic happened when we moved the bed against the feature wall and got a few accent pieces moved in. I’m pretty sure I could leave the room in this half disaster/half perfection state for a long time and still love it. Clearly Maddie agrees. She looks pretty dang comfy in the new space, right!?! Thankfully, we’ve got the pressure of the One Room Challenge to keep us moving and motivate us to get the room all the way done. That meant I couldn’t lounge around all day in bed like the dog. I had to get serious! I’ve been hoarding a pile of items that all needed to be spray painted so I could pop up my Spray Shelter and get all the painting done at once. 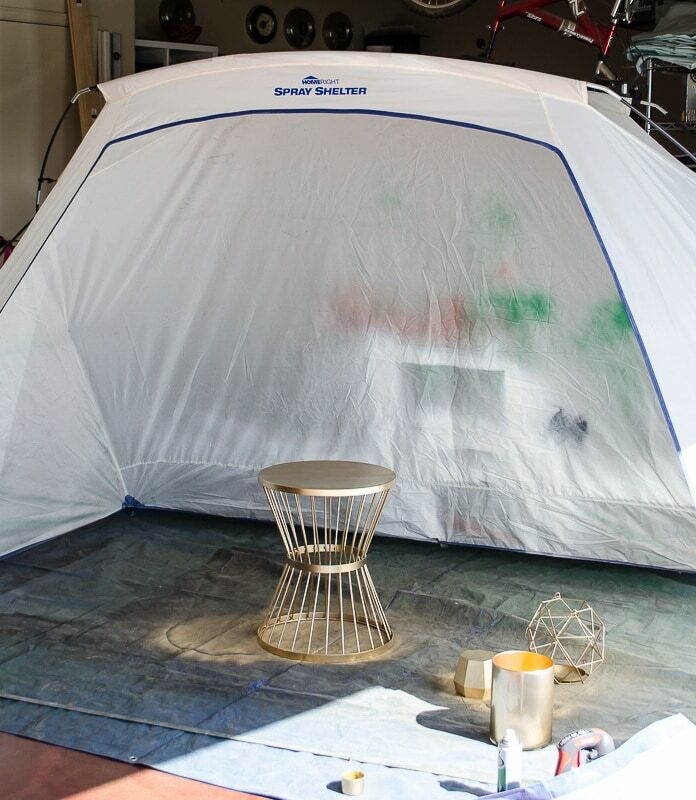 If you’re a regular reader, you know I LOVE the Spray Shelter because I LOVE to spray paint, but have a tendency to get it everywhere. 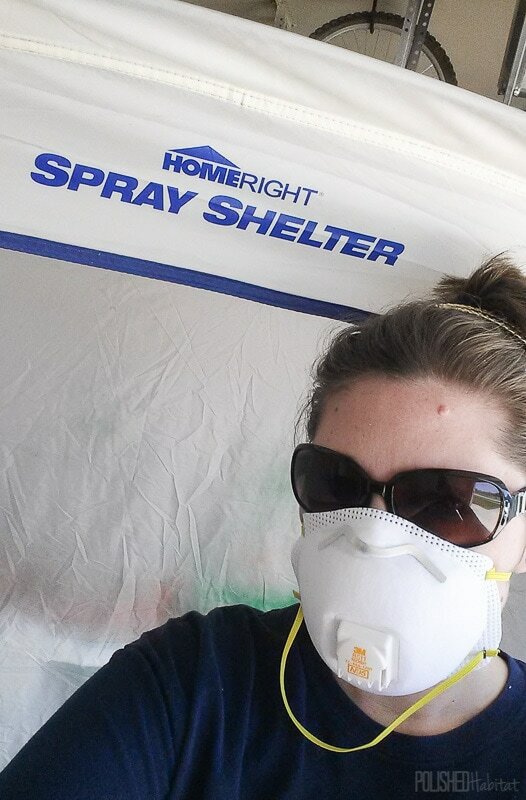 HomeRight is a returning sponsor for me in the One Room Challenge, and they offered up a Spray Shelter for one of YOU. Stay tuned to the end of the post for the GIVEAWAY!!!! Here’s what it looks like set up in the garage. I assembled it all by myself in 8 minutes and 22 seconds. Yes, I timed it because I was super curious. Based on the tiny bag the whole thing is stored in, I’m impressed every time I set it up into a huge tent. And can we talk about that chic table? It’s an outdoor table I found at Lowe’s for the budget friendly price of $39.98! As soon as I saw it, I knew it wanted to be gold. The newly gold table will go into the reading corner, next to the chair that I spent hours looking for, only to find it in my own living room. Yep, after way too much time spent trying to find the perfect comfy chic chair at the perfect (aka low) price, that could be delivered on a tight schedule, I gave up. Or had a brilliant idea. We already own a gray IKEA STRANDMON chair that works pretty well in the space. Long term, I’ll still be looking for something absolutely perfect that is less matchy with the bed. I’d rather go with this now and wait for the dream chair later than rush into something I’d regret by next month. Doesn’t the chair look great? Oh, so sorry, the chair is buried right now. And I don’t want to give TOO much away before the reveal next week. Hehehe. Since I cheated you on the chair corner, here’s one more thing we crossed off the list last week. 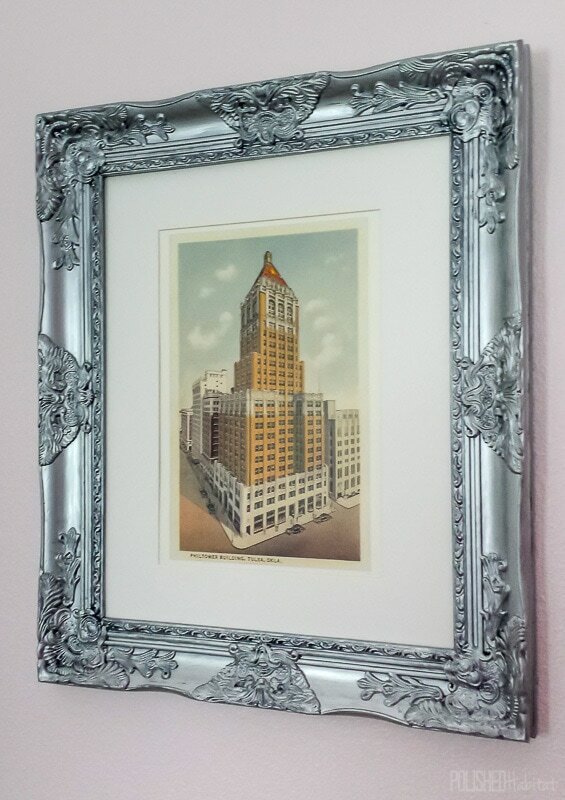 We framed the vintage building art with new frames (thank you Hobby Lobby 50% off! ), but instead of using them as we bought them, I painted them with the leftover Rust-Oleum Metallic Accents paint I used on the dressers. I’m totally obsessed with that stuff! I used a combo of the lighter Sterling Silver with the darker Real Pewter to give the frame some depth. Random side note, that building still exists in downtown Tulsa and many of the floors are now apartments. We toured one last year and want to live there SO BAD. If they were for sale and dog-friendly, I’d be 100% in. The hardest part of this week has definetely been the building of the 30″ x 40″ frames for each side of the TV. Seriously, it’s been a MAJOR what can go wrong, will go wrong fiasco. Night after night, something happens and we have to go back to the store, spend more money, and push things back a day. I know we’ll get them done. We built 6 with no issues in the office last year! The delay is freaking me out though. I’m not making the call on what other art to add to that wall until the frames are done and the big art is hung. Which means I’ll have very little time to both decide and implement. Yikes! The ideal scenario would be the wall looking “done” with just those pieces, but I just can’t decide until I see the spacing. The secret art project for above the bed is in progress now, but requires some more work as well. And we have two sets of wall-mounted bedside lamps, but I’m not sure either are going to be what I really want. Which would mean more last minute shopping. Eek. Send lots of happy thoughts for our final week, we’re going to need them! 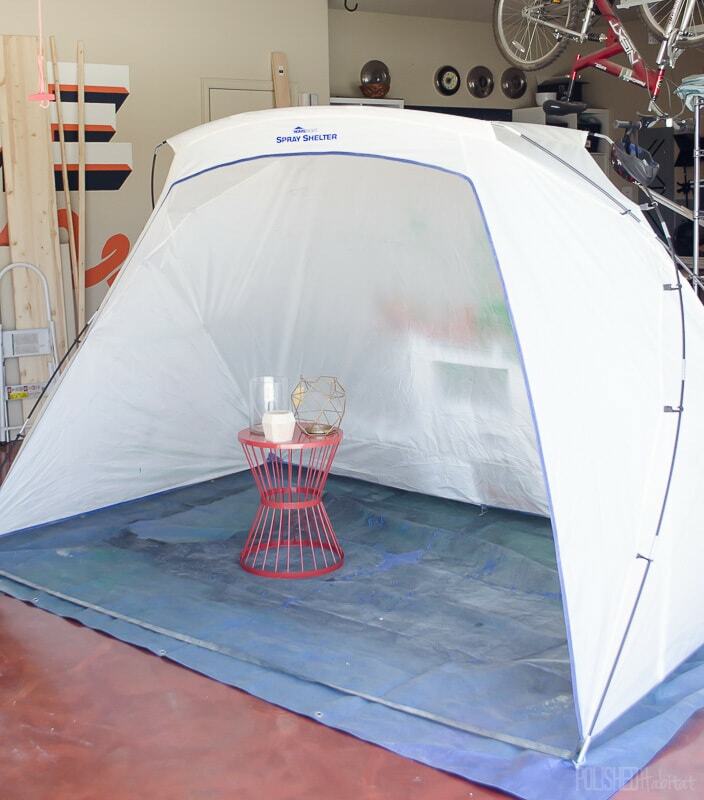 And don’t forget to enter the giveaway for the HomeRight Spray Shelter below. On mobile, you may need to click the words “a Rafflecopter giveaway” to enter. 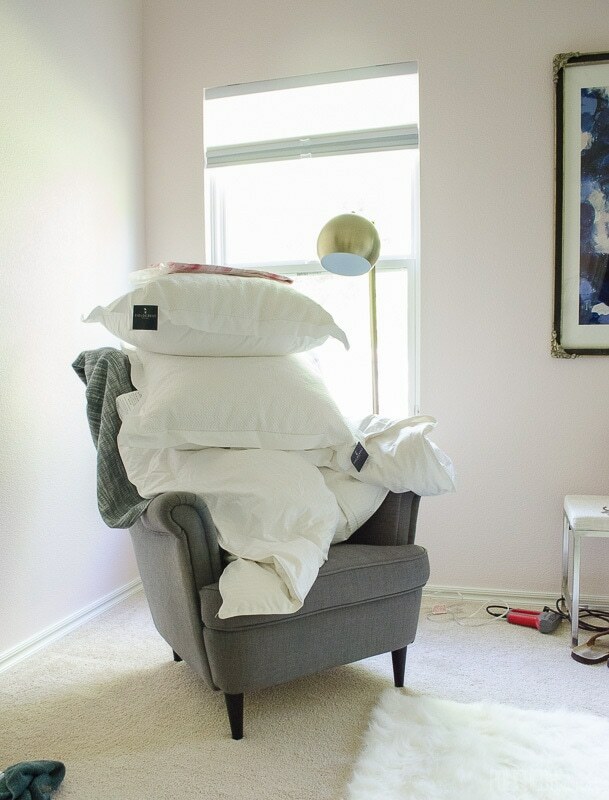 Don’t forget to hop over to Calling It Home to see what the other 150+ One Room Challenge participants are up to this week. Oh, the dark navy drapes against the pink walls are SO GOOD! And that wall behind the bed…I’m dying to see the whole thing now that it’s finished and painted white! I can’t wait to see the whole thing next week! Target, Lowe’s, and Home Depot ALL pretty much know me by name at this point in the process! Your bedroom looks awesome so far! I know you’ll be able to pull it all off! Yes! That was me before as well! My husband LOVES that I have the Spray Shelter now! Even the sneak peeks look awesome! That building is one of my favorites. 🙂 Good luck this week! You got this! I’m so glad I found your site…Where was the Spray Shelter when I needed it???? Seriously…. I’m so glad I read your post because I might have to buy one to keep it handy for future projects. Your room looks lovely. I like what I see so far. 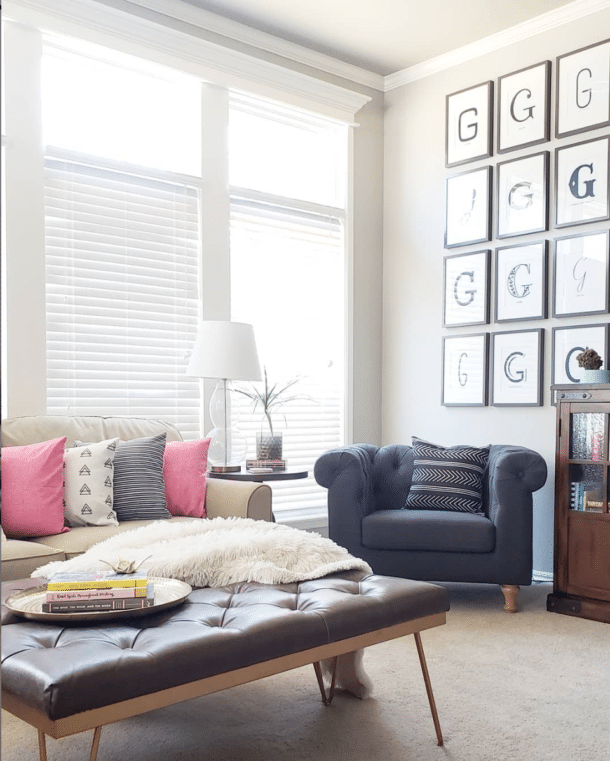 I adore navy but haven’t had the courage to go that bold in my own home. I look forward to your reveal. Hang in there, Melissa. I think you and I both have some late nights ahead. Excited to see your room next week! The room is really coming together!! It looks great. 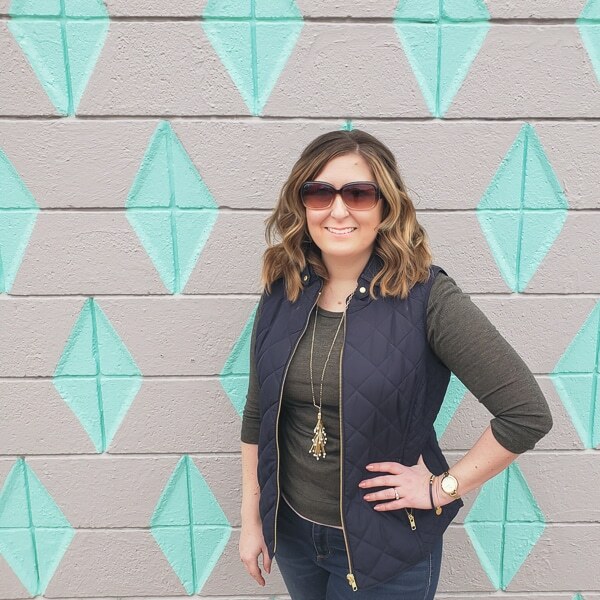 I’m doing my master bedroom too, and your wall makes me want to do it as well! Melissa this room looks amazing already!!!! The wall came out great and I love the drapes! Love the room! And thank you for sharing the spray shelter…I’m seriously going to buy one right now. Can’t wait to see the reveal. I have a lot of blue in my room too! I love the little sneak peek of the bed against your feature wall. I am so excited to see the whole thing next week. I am loving the way it looks so far! I need one of those spray booths, I am a spray paint junkie! Or maybe I could bust out that 8 man tent we’ve used exactly twice. Love the gold and blue combo, the reveal will be amazing I’m sure! Can’t wait to see your final reveal! This bedroom is going to be amazing! P.S. I feel like Maddie today. I need to get up and get going to finish strong this week. LOL that Target, Home Depot and Lowes know you by name…..my husband laughs when we go into Lowes and they all say hello to me. Love the gold and can’t wait for the reveal.